The Celebration Banquet is to be held after participants have completed reading Kamea. It could perhaps be a tea party or a meal. You may decide to give it a medieval theme, perhaps having it resemble the dinners Kamea attends in the Kingdom of Light. Depending upon the age and composition of the group, it may be fun to have participants dress up in medieval garb and to pass out "princess" crowns. Kamea shares her experience being rescued from the Kingdom of Darkness and brought into the Kingdom of Light, as well as her process of growth and transformation. 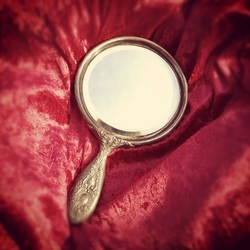 She brings her mirror and shares about how it was difficult to know which image to trust... the one in her mirror, or the one those in the Kingdom of Light shared with her. Kamea will also sing the song that is included in the book. She concludes by sharing that she was sent to share this message with the attendees and encourages them to accept the true King of Glory, Jesus Christ's, gift of salvation that they may enter and enjoy the Kingdom of Light as she does.